Driving through Thompson Pass on Sunday morning, new natural avalanches were everywhere. If all these slides weren't enough, the slide across our intended skintrack up the Worthington Glacier definitely nixed that plan. Brainstorming in the parking lot outside the Tsaina Lodge, Ryan from the Valdez Avy Center pulled up. He recommended checking out the trees around Tiekel Creek. Beta from the local forecaster - what good luck! At the parking lot below Rice Mountain, Taylor was already there. So were Courtney and Tobey. Seemed like the place to be. 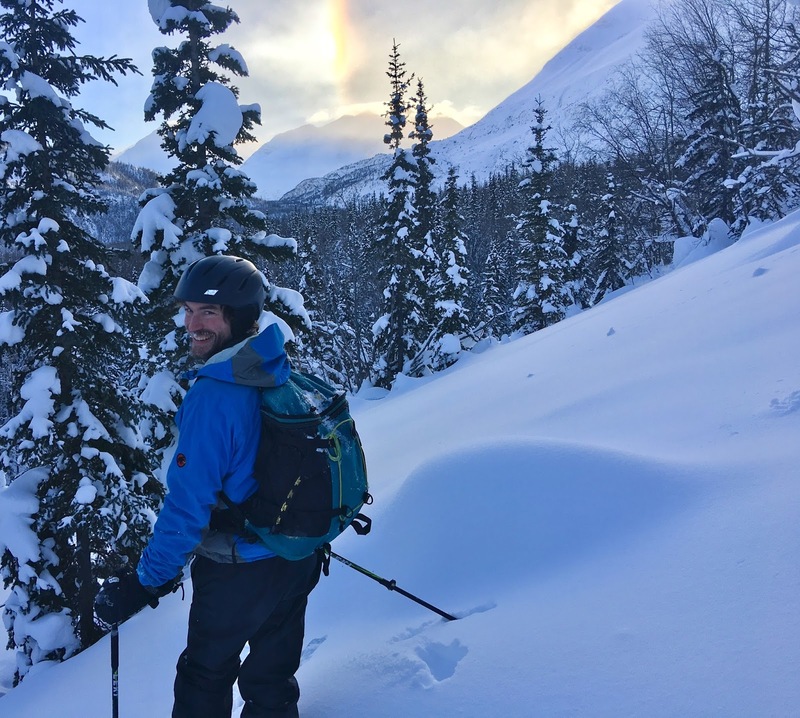 We chased Taylor up the skin track as twin sundogs floated in front of Mt Tiekel. Parhelions (AKA sundogs) flank the sun in a 22 degree halo. The angle is a function of the refraction of atmospheric ice crystals acting like prisms to bend sunlight in the atmosphere. Larger ice crystals wobble more as they fall, producing larger sundogs. At treeline we stopped to dig a pit. Just like the previous day, the unsettling whompf of failure and propagation on deeply buried surface hoar had the hair on the back of our necks standing straight up. With ongoing wind loading in the alpine and complex and unfamiliar terrain, we decided to stick to the trees below. Dropping into the well spaced forest of birch and spruce filled with soft snow, the trees seemed like a good choice. Andrew was stoked about it too. Or maybe he was just stoked about sundog science? Ready for more dreamy tree skiing, we headed back up the skinner. To the south, gap winds draining dense arctic air from the interior, were ripping snow off Mount Tiekel. These 70 mph winds were cranking plenty of wobbly ice crystals into the air to feed the sundogs. Back at the road and with ice cubes for feet, it was time to go eat halibut tacos courtesy of Taylor B. Thanks again Taylor!